Baby play yard gates are meant to help carve out a convenient, safe and enclosed playing area for your children either outside or inside the house in order to keep your kids occupied without having to constantly run after them. You will agree with me that children need a safe place to play, grow and explore, therefore, these playpens will give you the ease to keep your child safe, and also gives them a place to spread their toys as they enjoy themselves. Using such gates will help you to have peace of mind and assurance that your child is well protected even as you engage in other tasks around your home. These types of gates come as easily installed panels that are assembled and disassembled quickly.These panels have amazing versatility and flexibility that allows them to be set up in any part of your house. The panels are easily configured into diverse shapes in order to fit a variety of spaces. Whether in the middle of a room or up against a wall, either way you can set them up in any available safe place and in a way that best suits your needs. You can choose to install them in the bedroom, in the living room or in the kitchen while you cook. 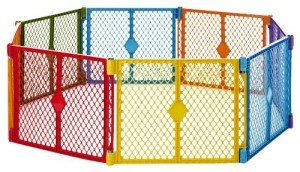 Apart from being used as free standing playpens, some of these gates can also used as fireplace screen, or as a safety gate that can be mounted in between walls, or as a barrier to block off hazardous areas or to secure areas such as the bottom of stairs. They are available in either metal, plastic or wood material. They also come in portable, lightweight and fold-able design so that you can easily transport and assemble them outdoors either in the garden or even at the park. 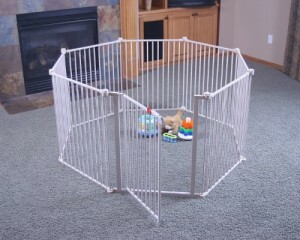 Among the factors to take into consideration when choosing a good playpen is their durability , weight, portability, color, size ,weather resistant material if meant for outdoors ,brightness or whether the play yard suits the aesthetics of your home. This attractive play yard is size adjustable and is available as 8 panels covering a diameter of 34.4 square feet or as 6 panels covering an area of 18.5 square feet.It measures 26 inches high.It is ideal for children from 6 to 24 months. Each panel measures 26 inches high and 30 inches wide. Additional panels can be purchased separately here. The panels are made of weather-resistant, durable plastic ideal for both indoors and outdoors. It is easy to set up since the interlocking panels are usually pre-connected for quick installation. The panels are easy to remove from each other if you want to make the play area smaller or to configure it to any shape. 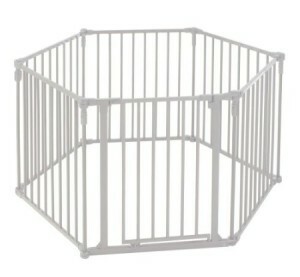 You can also buy a play mat here to use with the gate. The gate folds flat, is lightweight and has a carrying strap included for easier transportation. It is made in the U.S.A.It is available in the colorplay and Ivory colors. This free standing gate is size adjustable and is available as 6 panels covering an area of 18.5 square feet or as 8 panels covering a diameter of 34.5 square feet. It measures 30 inches high. Each panel measures 30 inches high and 32 inches wide. Additional panels can be purchased separately here. The gate folds easily and is lightweight for easier transportation. It has a walk-through door gate that swings in either way for quick access. This metal gate has 6 adjustable and detachable panels measuring 30-inches high.The 6 panels cover an area of 10 square feet.The gate has a walk through swinging panel with dual-locking system that is child proof for added safety. The gate features sturdy powder coated metal construction.It is ideal for children from 6 to 24 months. It has a 2 panel extension kit that can be bought separately here if you want an 8 panel play area. This white gate has a walk-through design with a single-touch, fast lock release lever. It comes as 8 panels that cover a play area of 19 square feet. It measures 28 inches high. Each panel measures 28 inches high and 24 inches wide. The gate is easy to set up and folds into a compact design that is perfect for portability, travelling, or storage. The gate features PVC-free, steel frame durable construction. The width between bars is 2.5 Inches. 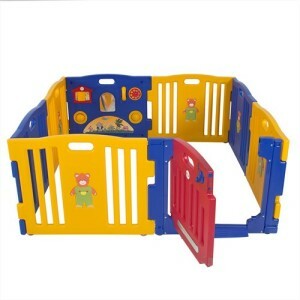 This colorful playpen is made of heavy duty thick plastic material.It comes with 8 panels that cover a play area of 73 inches. The panels measure 23.5 inches in height and 31 inches wide. They are easy to snap together and pull apart so that you can make the play area as long or short as you like or change the shape. It is easy to detach the panels apart and store them away. Included is a swinging hinged door with safety locks on the doors. It has suction cups for hold it firmly on the floors. This wooden sturdy superyard has 6 adjustable and removable panels. The attractive smooth wood has a nice honey color. It measures 30 inches high and encloses about 10 square feet.It has a walk-through swing panel with a double-locking child-proof system. It has wall mounting hardware included.A rubber pad has been included to prevent scratching. 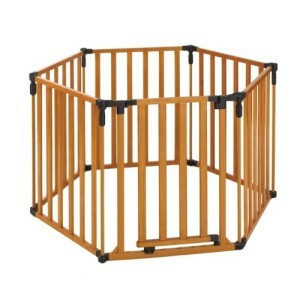 Get a durable play pen that you can easily set up anywhere you go and give your child a fun, safe playground.